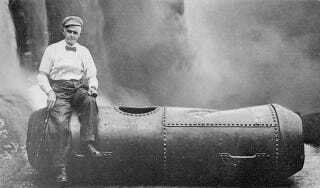 In 1911, Bobby Leach became the second person to survive going over Niagara Falls in a large steel barrel. Despite his incredible feat of bravery/stupidity, his death years later was from something rather mundane: The former daredevil slipped on an orange peel. The New Zealand newspapers seemed to think Leach's injury wasn't such a big deal when they first reported on it February 27, 1926, explaining that he had simply broken his leg. But his broken leg became infected with gangrene and the limb had to be amputated. Leach's health deteriorated rapidly after the amputation. By April, he was dead. "Bobby" Leach, known to the world as the only man to survive, the feat of going over Niagara Falls in a barrel, died in a private hospital in Auckland yesterday. He was aged 69 years. After a life of intrepid exploits and hair-breadth escapes, the actual incident that led to his death seems like one of those ironies of fate that bestrew the pages of ancient fiction, for having defied death a hundred times he at last owed his end to a piece of orange peel. Mr. Leach had just concluded a lecturing tour in New Zealand and was strolling along the pavement close to his flat in Princes Street when he slipped on the orange peel and broke his leg. That was on February 26, since when he had been an invalid. There can be little doubt that the leg injuries he received during his memorable drift in the barrel were responsible for the weakening of the limb that was broken. Complications set in and on Monday the leg was amputated, but the patient rapidly weakened and died. This interesting tidbit from history is often phrased as "the first man..." which is somewhat misleading, given our history of using "man" to mean "human" in English. The first person to survive a trip over Niagara Falls in a barrel was Annie Edson Taylor. She died at the age of 82 from natural causes.